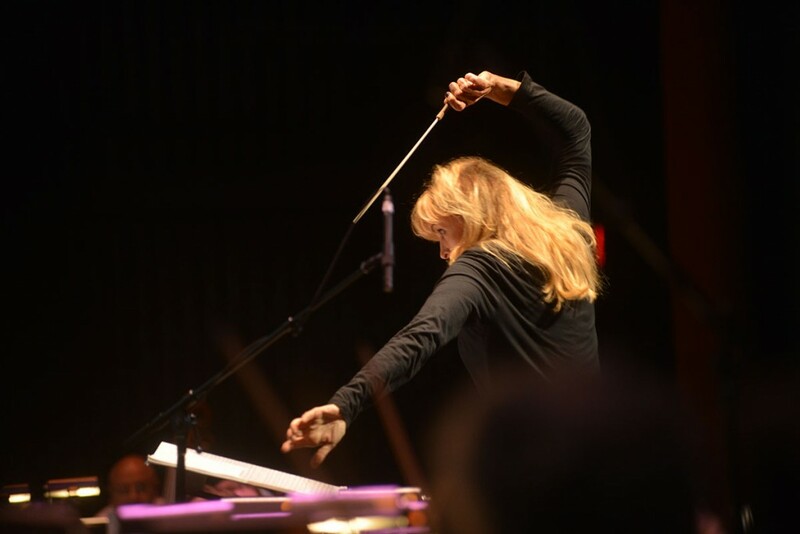 Amy Andersson, Conductor – Music Director and Conductor for the 2015-2016 world tour of The Legend of Zelda Symphony of the Goddesses. Conductor Amy Andersson is known most recently as founder and Music Director of Orchestra Moderne NYC, a game-changing new ensemble in New York City that recently made their successful debut at Carnegie Hall on October 7, 2017. Appearances on Late Show with Stephen Colbert, CBS Morning News, CBS Evening News, and press coverage in the Wall Street Journal have led music critic Norman Lebrecht to call her “America’s most-watched Symphony Orchestra Conductor. Hear Orchestra Moderne NYC debut the world premiere of Women Warriors: The Voices of Change, coming fall 2019 to New York City. A team of Hollywood female film composers and documentary creator Amy Andersson have joined forces to produce a social justice concert experience. With thrilling live-to-screen visuals and a full symphony orchestra, this is unique experience is not to be missed! Ms. Andersson was most recently appointed adjunct Professor of Conducting at Feirstein Graduate School of Cinema/Brooklyn College in 2019. In season 2017-2018, Ms. Andersson became music director of the new American opera project “A Most Dangerous Man” by composer/lyricist Greg Pliska and librettist/ director Charles Morey, and conducted Classic FM Radio Orchestra of Bulgaria in the world premiere of the video game concert, The World of Video Game Music in Sofia, which featured the music from World of Warcraft, Everybody’s Gone to the Rapture, Mario:Rabbids Kingdom Battle, Prince of Persia, Gears of War, Assassin’s Creed Rogue, Call of Duty, Victor Vran, Lord of the Rings Online, Divinity: Original Sin ll and Fallout 4, among others. In season 2015-2017 Ms. Andersson was music director of the world tour of the video game concert The Legend of Zelda: Symphony of the Goddesses, and in 2014 toured with the video game show Replay: Symphony of Heroes. Ms. Andersson has toured to over twenty two countries as a conductor of operatic, symphonic, Broadway musical, and video game repertoire. She has made appearances with the St. Louis Symphony, Houston Symphony, Seattle Symphony, Oregon Symphony, Colorado Symphony, Rochester Philharmonic, Honolulu Symphony, Royal Philharmonic Concert Orchestra, Stockholm Concert Orchestra, Spanish Philharmonic, Chicago Philharmonic, Classic FM Radio Orchestra of Bulgaria, National Orchestra of Mexico, Video Game Orchestra of Boston, Kitchener-Waterloo Symphony (Toronto), Orchestra Massacarra (Milan), Spanish National Youth Orchestra (JONDE), Florida Orchestra, Classic FM Radio Orchestra of Bulgaria, Plastic Acid Orchestra (Vancouver), Lithuanian National Symphony Orchestra, Junge Deutsche Philharmonie, Bundes Jugend Orchestra, Niederrheinische Symphoniker, LOH Orchestra Sonderhausen, Berliner Symphoniker, Giessen Philharmonic, Aalborg Symphony Orchestra, (Denmark), Macedonian Philharmonic, Jeunesses Musicales Deutschland, Les Musicales du Trophee, (France), and the Colorado Music Festival, as well as free lance orchestras in Switzerland, Belgium, Netherlands, Italy, and Ireland. She has lead opera productions in Germany at the Deutsche Oper am Rhein, National Theater of Mannheim, Stadttheatre Aachen, Weikersheim Opera Festival, Rheinsberg Chamber Opera, Schlosstheater Schwetzinger, and the Colorado Light Opera. Ms. Andersson began piano studies at an early age. She received her BMA from the University of Michigan and received a MM in conducting from the Mannes College of Music at the New School. She was awarded a conducting Fellowship to the Aspen Music School and her teachers have included Paul Vermel, Murray Sidlin, David Zinman, and the late Yakov Kreizberg and Gustav Meier.